"Once a working 3d printer has been made, work can begin on the Cyberdyne Hydraulic Control System. 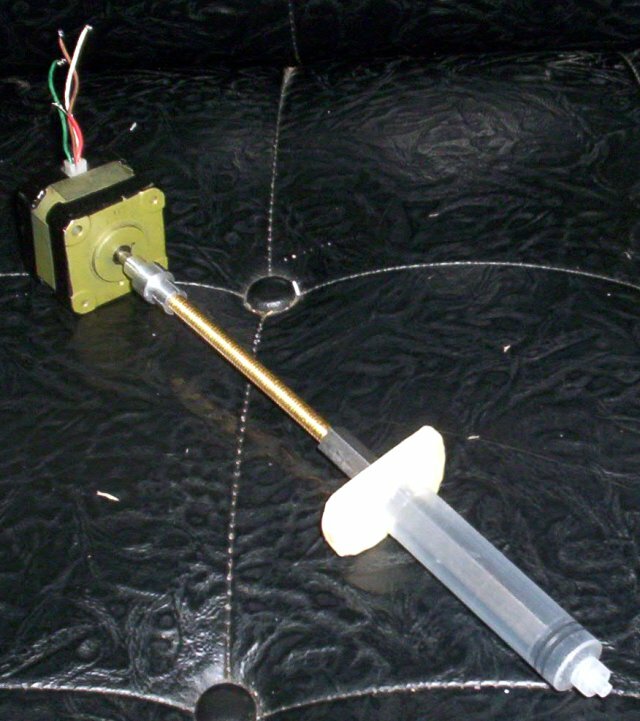 This system is modeled after paste extruder toolheads using a linear actuator to drive a syringe via another syringe at a 1 to 1 ratio. The purpose of this is to separate the heavy power source and the drive mechanism so that a light weight drive mechanism can be used on the moving elements of the Cyberdyne T-800. Now that the design rationale has been explained, it is a downhill battle from here. I intend to have a working prototype of both the T-1 and the Hydraulic Control System by May of 2010." 1. Lack of mechanical advantage vs. gear driven. 2. Difficulty of tapping such a deep hole combined with a lack of availability of such long internally threaded couplers. However: multiple short coupling nuts [| External link: small parts] can be combined via a broached keyway/plastic welding. The broached keyway approach would be to stack them on a threaded rod tightly against each other, put that in a broaching die, and then run a broach through the die to put a keyway in all of them. Since the material is nylon: the broach can be hand made from a variety of materials including mild steel. In order to use this process: the threaded rod would need to become the plunger, and the stepper coupling would become the nut. However this is not ideal because the threaded rod becomes exceedingly long in order to allow the syring tube to stay clear of the nut. Other processes I am optimistic about include cutting the syringle plunger in half(heated piano wire?) softening the plastic, and then pressing the halves together on threaded rod to mold threads. A sleave can be used, or the plunger can then be wrapped in wire to hold the two split halves together on to the thread. Since the material is plastic: it may be possible to fabricate a make shift gun drill from piano wire, and make a long deep tap by grinding down the shoulders and welding and extension to it. For now: I intend to use the http://www.reprap.org/bin/view/Main/DC_Motor_Driver_1_1 or the http://www.ladyada.net/make/mshield/ as the electronics portion of this. This page was last edited on 25 November 2011, at 13:54.